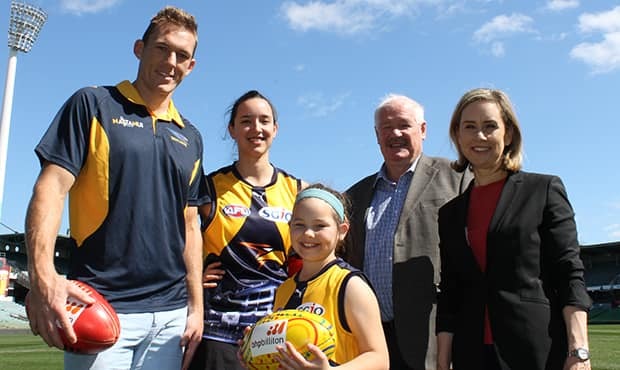 Western Australian Sport and Recreation Minister Mick Murray has thrown his support behind the West Coast Eagles' bid to enter an expanded AFL Women's competition in 2019. The Minister penned a letter of support outlining the State Government's strong backing for the Eagles to become WA’s second professional women's team, which the club included in its official AFLW bid. The AFL is expected to announce which new teams will join the AFLW league in 2019 later this week. West Coast was one of five clubs granted a provisional AFLW licence in 2016. Minister Murray believed a second WA-based AFLW team would boost grassroots participation and promote pathways for female players, coaches and officials. "Women's football is booming throughout the State at all levels and it is time we had a second professional team in WA,” he said. "I provided the West Coast Eagles with a letter of support as part of their application to highlight that the State Government is right behind them in their bid. "The McGowan Government is a strong supporter of women's sport and this is the next step for football in WA. "One of the best things about the rise of women's football is that it is proven to be engaging women and girls who were otherwise not playing sport. "For whatever reason, AFL Women's is attracting girls back to competitive sport or getting them to participate for the first time, which is fantastic." Women's Interests Minister Simone McGurk said the State Government was committed to providing opportunities to WA women in all aspects of society. "Celebrating the talent of female sporting achievement through the expansion of AFLW will inspire young girls to follow their dreams and make them a reality,” she said. "It is part of the wider vision for gender equity across our state, with opportunities such as this for women to make genuine choices about their lives and challenging attitudes about women's sport."